Our experienced Jacksonville estate planning lawyers, Florida Probate lawyers, Jacksonville elder law lawyers & counselors and Jacksonville asset protection attorneys at the Law Office of David M. Goldman help protect families in Florida, including Jacksonville, Orange Park, Atlantic Beach, and Ponte Vedra Beach, from unnecessary expenses and risks to their estates and assets. Proper estate planning & elder law can help protect you and lower risk to creditors and costs of probate administration in Florida. Our lawyers utilize some of the best estate planning, probate, and elder law tools including the iPug™ Asset Protection Trust - Your elder law or estate plans new best friend. (a Florida Asset Protection Trust). Our estate planning, elder law, probate, and asset protection lawyers enjoy explaining the unique aspects of Florida Asset Protection, Jacksonville Foreclosure Defense, Jacksonville Estate Planning, Jacksonville Probate, Jacksonville elder law and Florida Business Formations, and closely related practice areas to our estate planning and elder law clients. We explain the top benefits of your plan and your options in easy to understand language. Next, we use our knowledge of Florida Asset Protection Law to find the best or most ideal options for our clients’ Jacksonville estate planning and elder law needs. We also provide estate planning documents and help protect our clients' assets who live in other areas of Florida. We believe that a Jacksonville estate planning lawyer, elder law attorney, and counselor should enable an individual to control their assets while alive and protect their assets for use if they become incapacitated. Upon your death, a properly drafted estate plan and asset protection plan should provide a smooth, worry free ability for your beneficiaries to receive your assets in the manner you pre-define. This process should protect your beneficiaries from situations where your estate may be placed at risk to the beneficiary's creditors. While estate planning lawyers and counselors can create very complex documents, our attorneys' goals are to make the decisions easy, by providing you with our knowledge and understanding of an estate plan and options that enable you and your family to achieve your estate planning goals. The first step in creating an estate plan is for us to have an understanding of your assets, risks, and objectives. Once our lawyers receive this information, our estate planning attorneys can design an estate plan that can achieve your goals. In some cases, an estate plan may involve a Florida will along with medical and financial powers of attorneys. For others, additional estate planning documents include special deeds and trusts. Our estate planning lawyers have created very special documents for almost every need. For those who need documents fast, we are very responsive and our typical start to finish time for an estate plan is 1 week or less. In emergencies, our lawyers may even be able to have documents ready in 24 hours. We focus on providing individualized estate planning documents that are designed to meet your goals and objectives at reasonable prices. As our clients get older, we talk with them about the importance of including planning to protect their estates from loss in the unfortunate event that Medicaid issues arise. By mixing estate planning with elder law, we can create an estate plan that protects your assets from loss in the event that care is needed. One of our goals in creating your estate planning documents is to avoid probate and court supervision and delay in distributing assets to your chosen beneficiaries. When a family member has passed away, it may be necessary to Probate his or her assets when their estate planning has not dealt with their assets. We strive to minimize the effects of a probate in Jacksonville. A probate in Florida is necessary to gather one's assets, pay the bills and distribute the remaining assets to the proper beneficiaries. We offer multiple types of probate administration, including Formal Probate Administration and Summary Probate Administration. 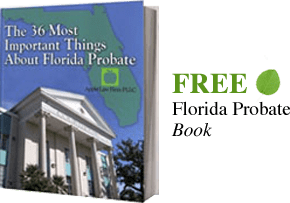 A summary Probate administration is available in Florida when the decedent died more than two years ago or the total amount of assets subject to a Florida Probate is less than $75,000. The best time to find out about your options is now; call our Jacksonville estate planning and probate lawyers today for a Free Consultation*. We also deal with some of life’s less fortunate situations, including Jacksonville Divorce, Child Custody, Jacksonville Criminal Law and Jacksonville Bankruptcy. Our Jacksonville lawyers are always concerned with the protection of our clients' assets, including their personal freedoms. We invite you to explore our website to learn more about who we are, what we do and how we can help you in all areas of Florida Asset Protection. Or, please contact one of our Jacksonville Foreclosure Lawyers, Jacksonville Estate Planning Lawyers, Jacksonville Elder Law or Florida Probate Lawyers to discuss your situation in person. Jacksonville, Florida among the top ten cities in the Nation in Foreclosure Filings in January 2013 Florida remains the foreclosure capital of the United States, and outside of South Florida, the Jacksonville Florida metro area is leading the pack. 3Plan for Your Future Today! Fill out the contact form or call us at (904) 685-1200 to schedule your Free Consultation*.